Here is one project that couldn’t help the way it turned out! 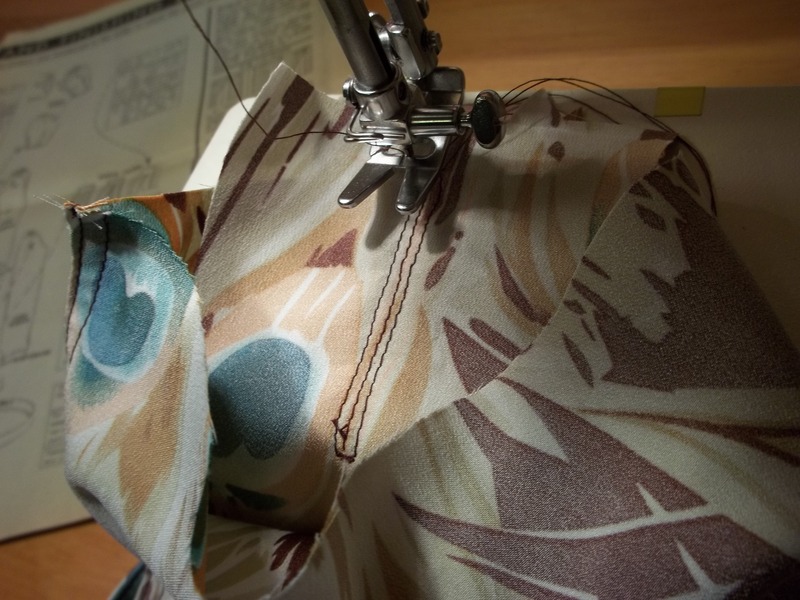 It was one of those special garments that kind of makes itself…and in this case, that is a VERY good thing. 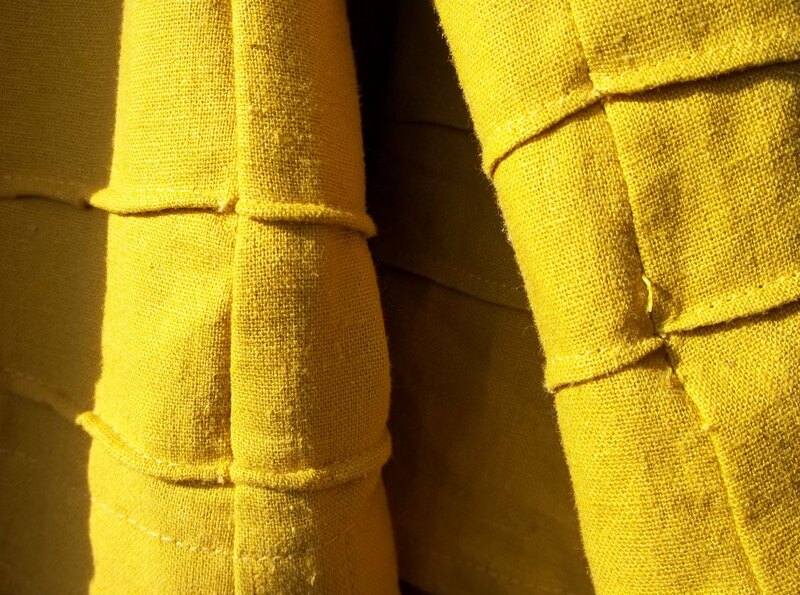 I merely knew what era I wanted (the 20’s), knew what color (mustard yellow) and fabric (linen blend) I wanted to be working on, then, with plenty of fashion research, did whatever seemed right. I can’t lay claim to any one specific pattern or garment as an inspiration. 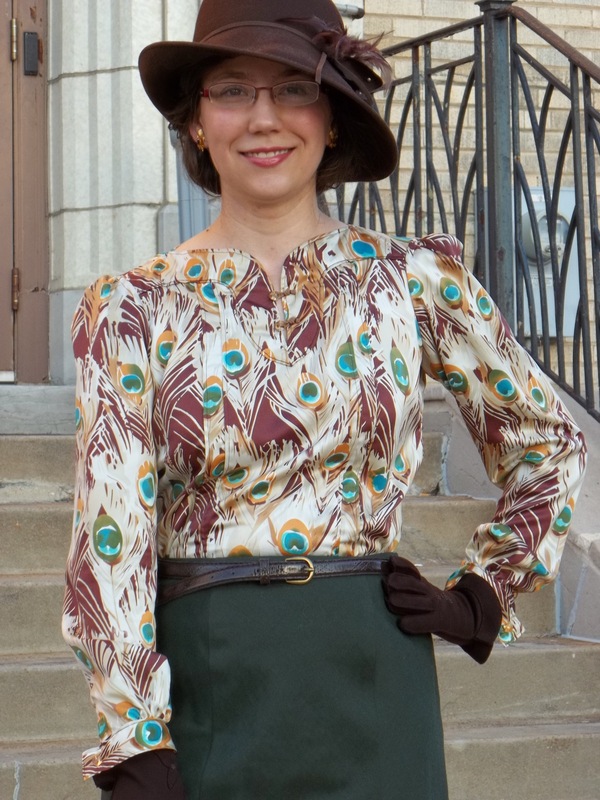 The finished tunic is simply my best expression of the Art Deco styling I love about the 20’s. There is a one-of-a-kind historical accuracy about this tunic that seems so perfect for our modern times just as well as 90 years ago. 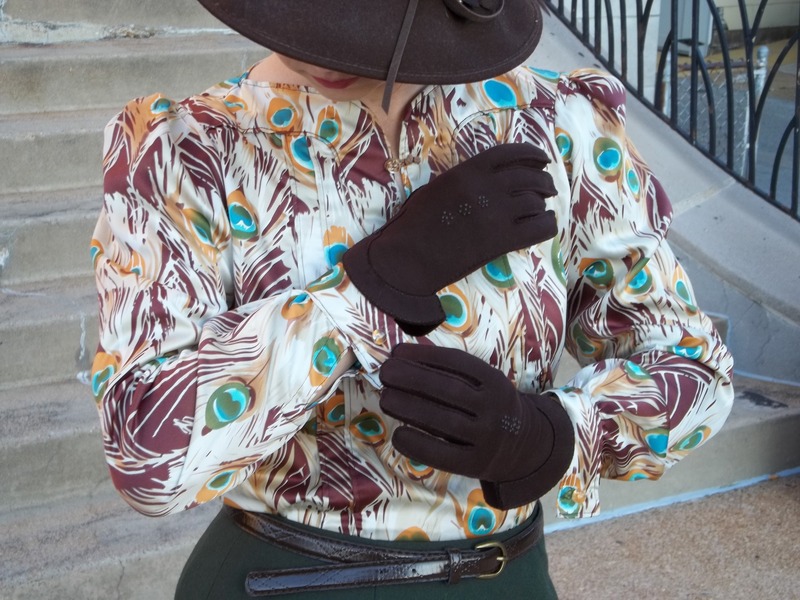 This is the second 20’s inspired tunic top I have made. My first one can be seen here. 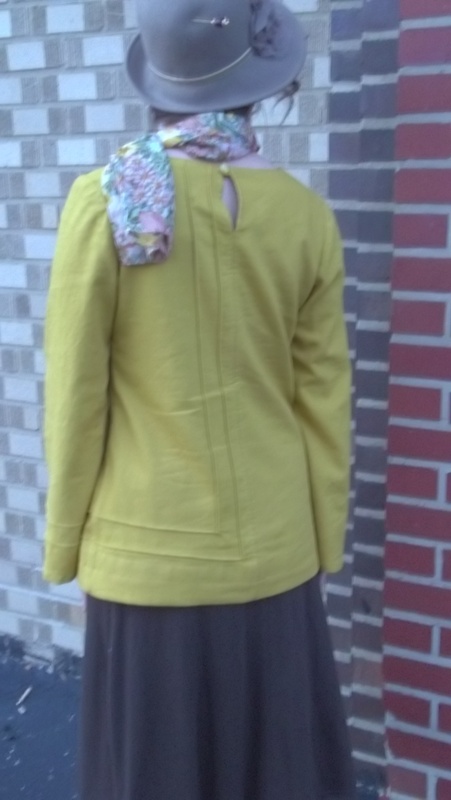 FABRIC: I used 3 1/2 yards of a 62% linen/38%rayon blend fabric. It has a loose weave, almost like lightweight burlap (perhaps you will notice this in some close-up shots), and has a slightly scratchy, natural feel to it. The color is a unique mustard yellow that has a bit of green undertones in the shade. NOTIONS: I only needed thread, so, with such an odd color, I did buy one matching spool of Dual Duty thread. I also bought a pack of golden yellow pearlescent square buttons for the back closure. 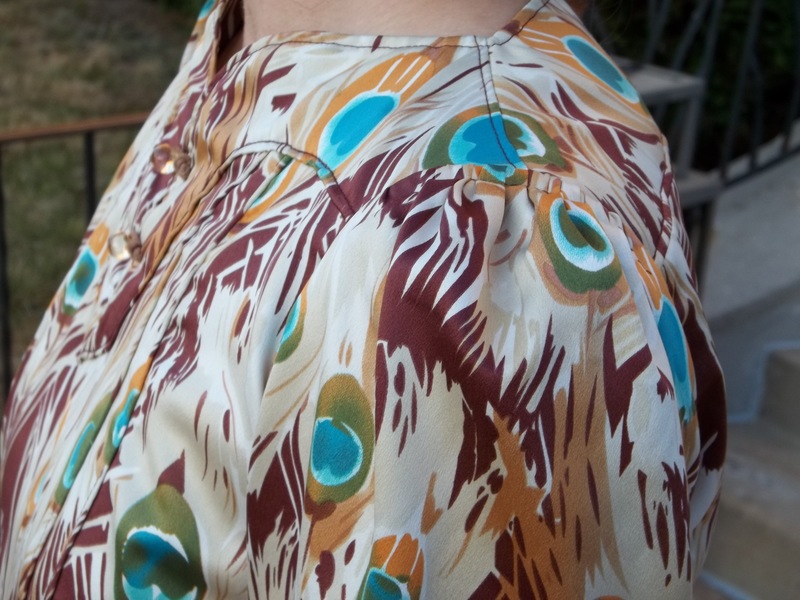 PATTERN: I used a modern out-of-print pattern to make my tunic, on account of its similar fit to 20’s style clothes. 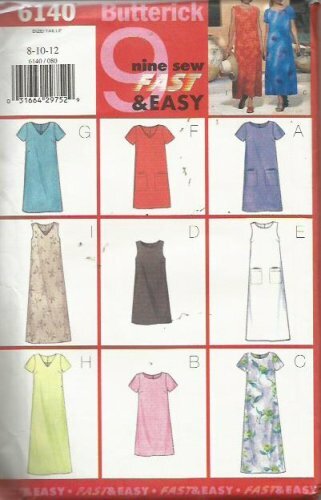 It is a Butterick 6140, year 1999, view F, shortened and without the pockets. 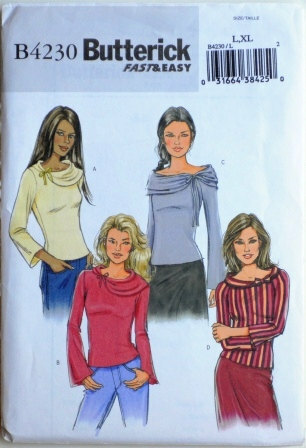 I also used one of my favorite patterns, a Butterick 4230, year 2004, for the long bell sleeves. TIME TO COMPLETE: This top was unbelievably quick and fun! It was done in a total of 10 hours, and it could’ve been less but I took my time enjoying this project. 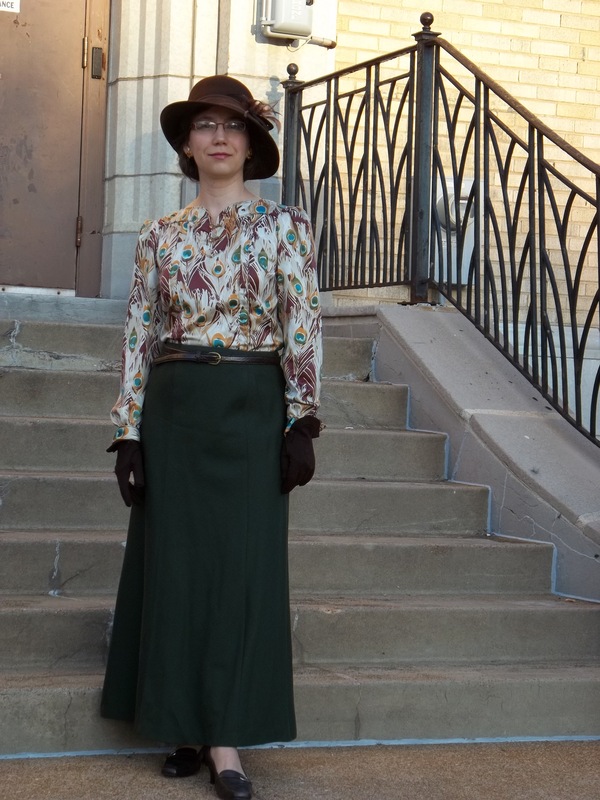 My 20’s tunic was done on December 3, 2013. 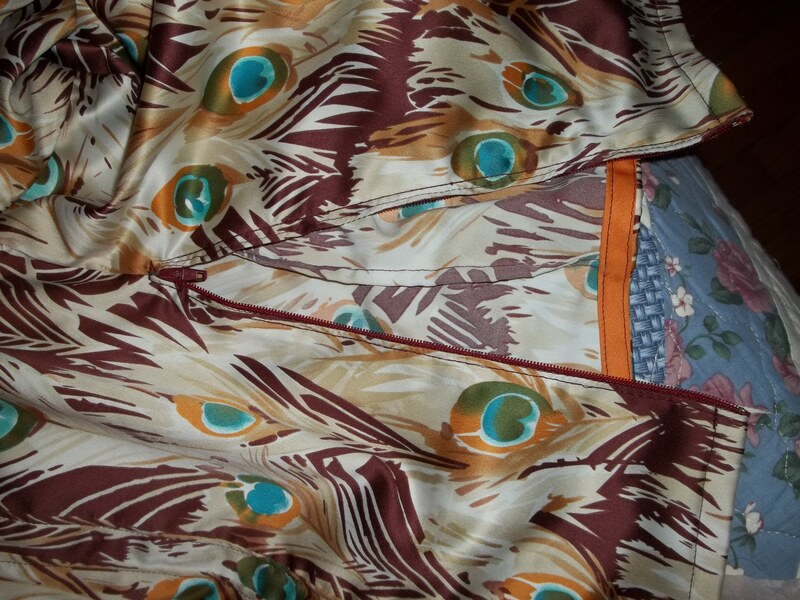 THE INSIDES: The neckline is self-encased by the second layer of fabric (the tunic’s main body is double layered). 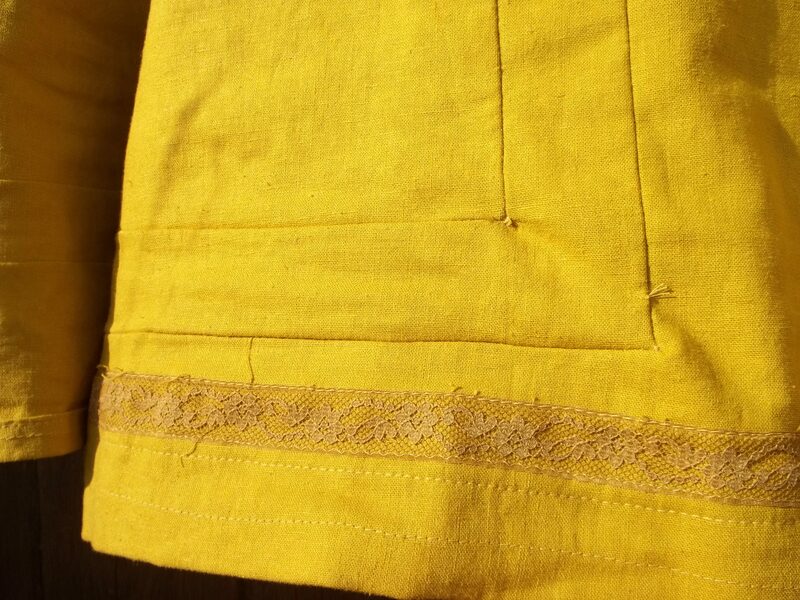 The side seams and sleeves are French seams, the back center is a clean finished (turned under), my shoulder/sleeve seams are raw zig zagged edges, and the bottom hem is covered by brown lace hem tape (see right picture). HISTORICAL ACCURACY: Relatively accurate; I built upon ideas from old original posters. (The posters below are “Australian Home Journal, March 1, 1930” and “L’Echo de Paris” newspaper fashion page from the 20’s) I believe I only used sewing methods and fabrics that would have been available for the 20’s/maybe early 30’s. 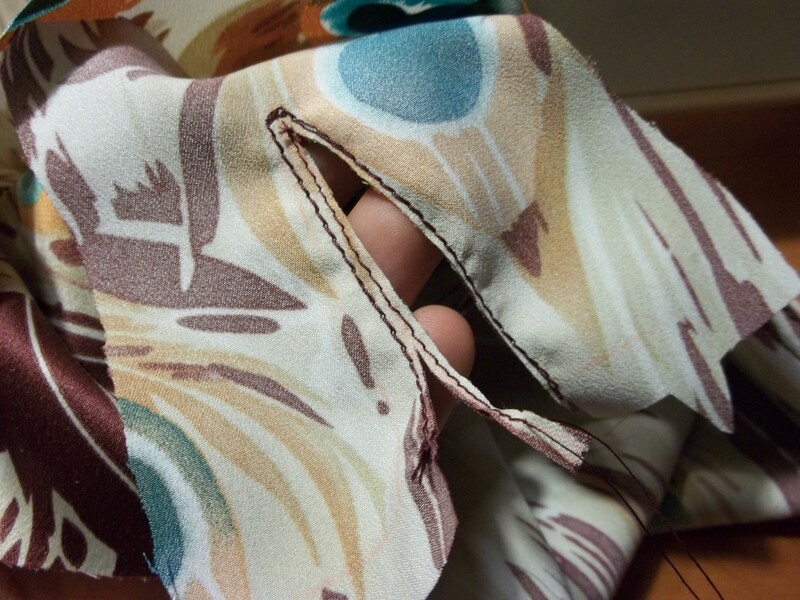 I also opted for a simple self-fabric loop and button closure since zippers (or technically slide fastener) were not widely accepted yet in the 20’s. The basic tunic, like I mentioned above, went together in such a flash you could’ve blinked and missed it. I made some slight changes to the construction to suit my needs, such as doubling up the main body of the tunic and shortening the dress pattern to a hip skimming length. Double layering the body helps my 20’s tunic hang better and it guarantees no see through. 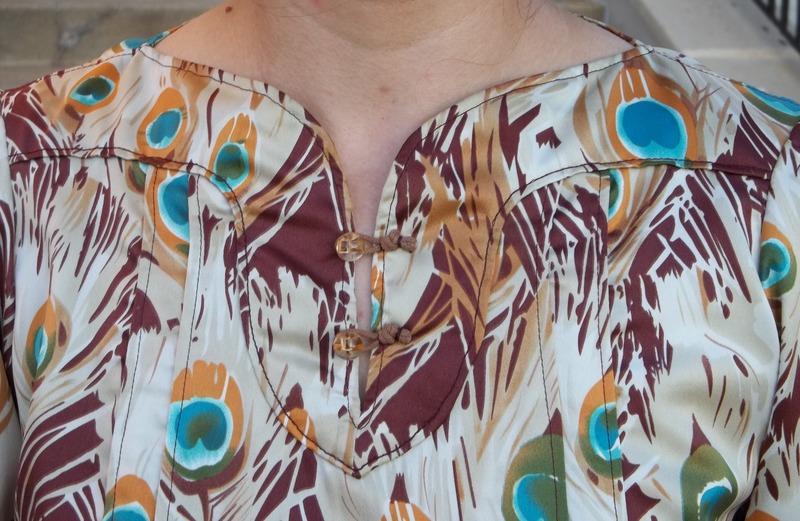 Besides those reasons, I was able to easily make a cleanly finished neckline without facings. How? I sewed the four shoulder seams (two on the ‘lining’ top and two on the ‘good side out’ top) first, then sew the entire neckline and back button placket with the right sides together, and wrong sides out. When the right sides get turned out, the neckline merely needs a top stitching to cleanly set everything in place, and the rest of the tunic (side and back seams, hem, and sleeves) goes together as normal. I have done this “doubled-up” method to other projects (link here and here) so as to simplify an already easy project. I love anything that helps me make the most of my time! 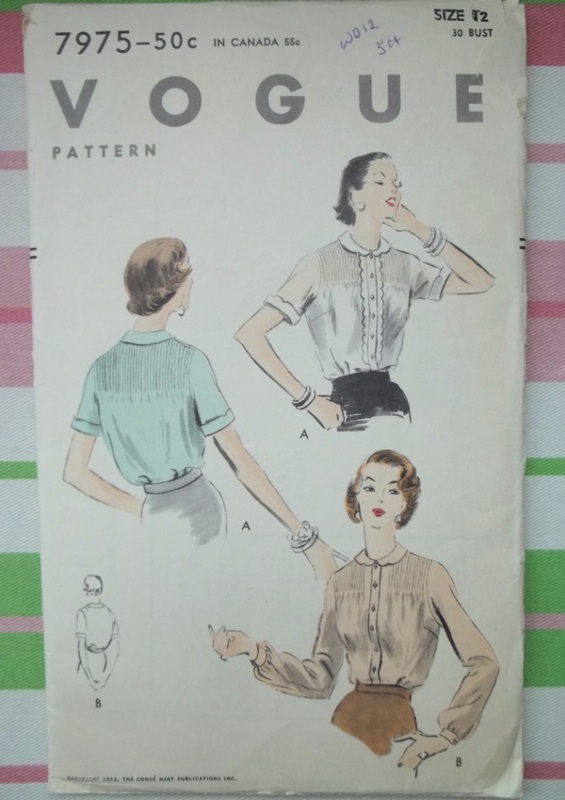 My Butterick 6140 had never been made up yet, and I’m surprised that such a gem in my pattern cabinet never got noticed before. Such a basic pattern has great potential in my eyes, especially knowing now that it fits me “to a T”, needing no adjustments to be my instant perfect size. There is just enough ease in this dress pattern to really be a pullover (perfect for the relaxed 20’s styles) without any difficult wiggling to get into it, either. 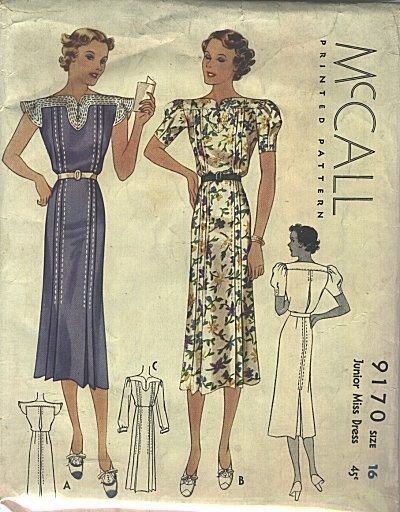 You bet I’ve got a few knockout 20’s dresses in mind to make using some spruced up reincarnations of the dresses from Butterick 6140. At first I had planned on adding a bow and/or a collar once my basic tunic was sewn together, like the three poster ladies in yellow above. 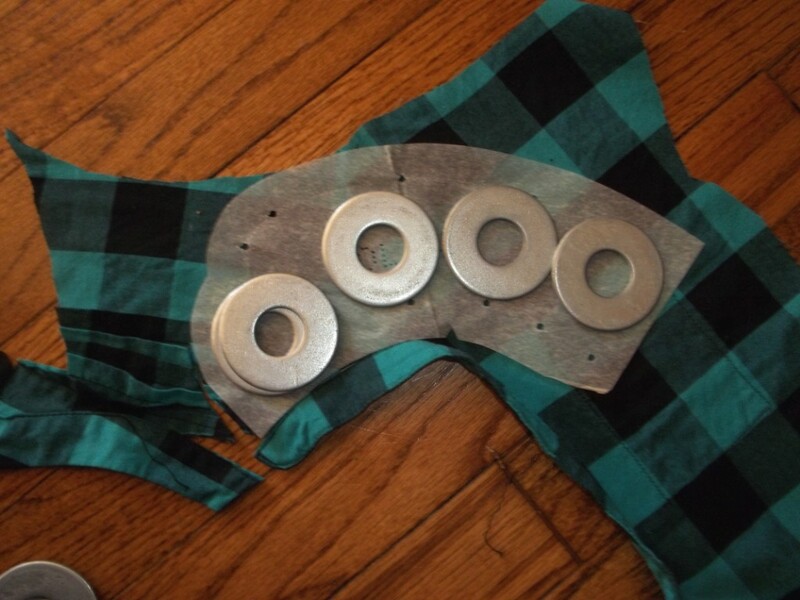 But once my tunic was together, a bow at the neck just didn’t seem like it would work well, and I began tending towards taking a different style, a simple Art Deco. 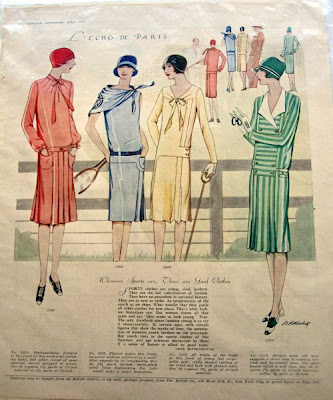 I loved the vertical stripes on the dress of the lady in yellow (from the “L’Echo de Paris” poster). 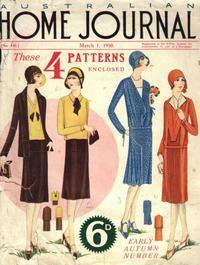 I still wanted the brown/yellow day suit combination on the left half of the “Home Journal” poster. Over the course of a few non-sewing days, I did some passive brain crunching to figure out a simple, decorative way to add a Deco design. 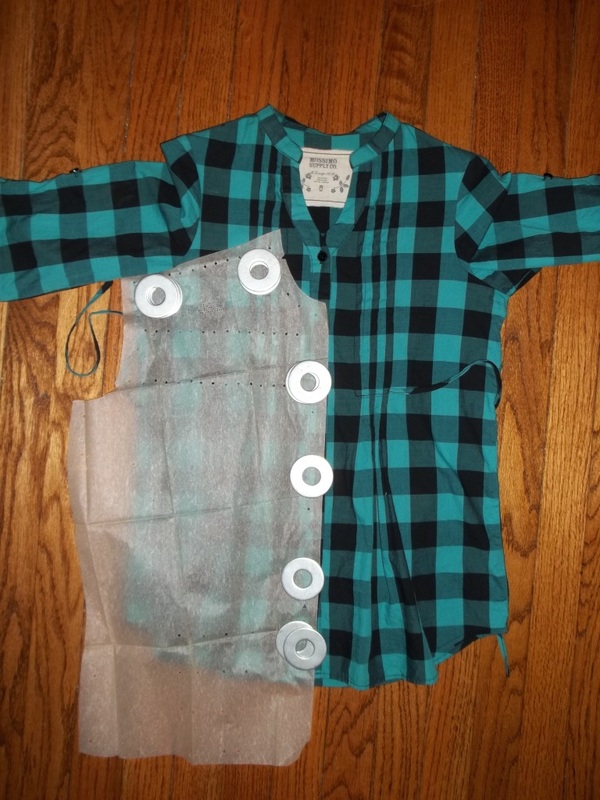 Self-fabric tubing and ribbon were some of my first ideas of what to add to my tunic, but I was wanting something more simplistic. 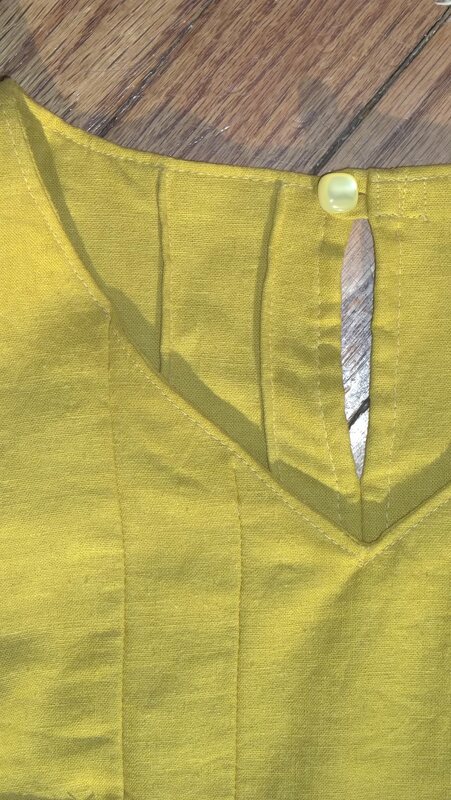 Using tiny pin tucks to jazz up my tunic gives me the perfect answer to my design desire. 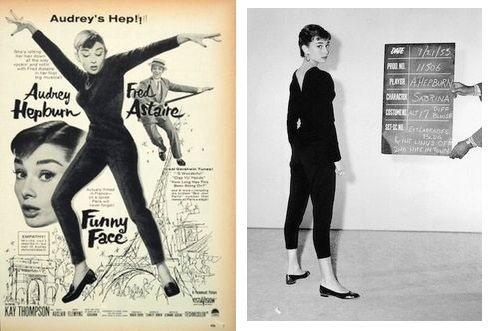 The pin tucks also give me a combo of both inspiration poster pictures – I get to be truly authentic while also true to my personal taste. Art Deco designs are characterized by rich colors, bold geometric shapes, and an embrace of technology, as seen in many architectural designs. 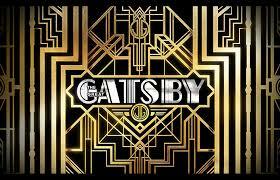 For a recent reference, see the line designs of the opening credits (see left small picture) in last year’s “The Great Gatsby” movie. 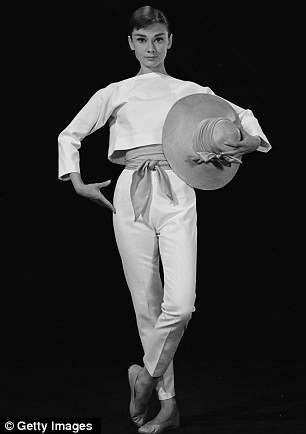 With this in mind, and with my adoration for the mathematician/designer Vionnet, I made the measurements and lined pin tucks on my tunic very precise, symmetrical, and exact. My sleeve hems end at 1/2 inch above the tunic hem, to compliment the tunic and create a square look. 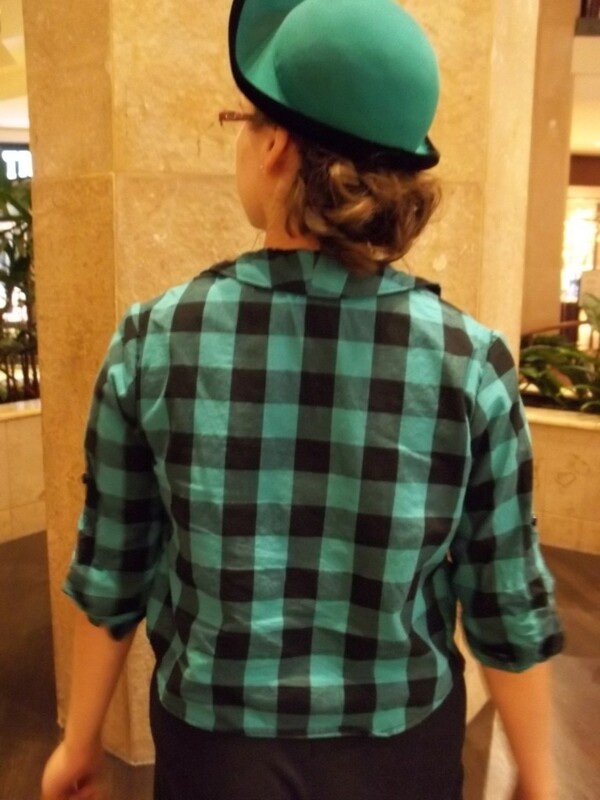 Remember, my back neck closure is also a square button. The ‘V’ neckline adds another geometric shape. The two rows of pin tucks are on my left side, and 1 1/2 inches apart from each other. The first row starts 1 1/2 inches away from the center of the tunic. What number do you get with 1 1/2 inches times two? 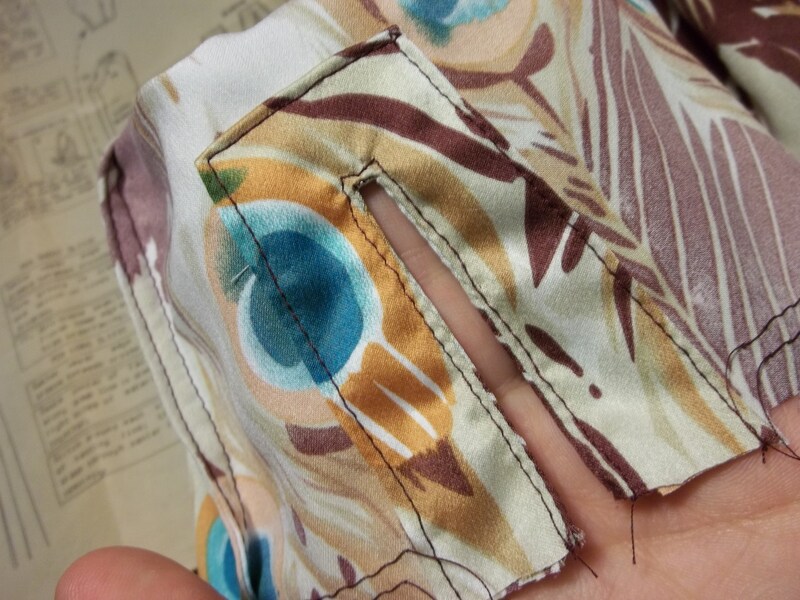 That’s right, the horizontal pin tucks start at 3 inches up from the bottom hem. How’s that for someone (like me) for whom math isn’t a strong point. I did the lines of tucks on the front only, at first, then, after talking it out with my hubby, decided to extend the lines around and back up again. My left sleeve also was bestowed pin tucks when I discovered it was slightly longer than my right one. I guess I had done a slightly imperfect hemming job but it was turned to my advantage because the tucks made the sleeves equal in arm length and matching with the design on that side. I measured and double checked to get the sleeve tucks perfect and I’m proud of how cool it turned out. 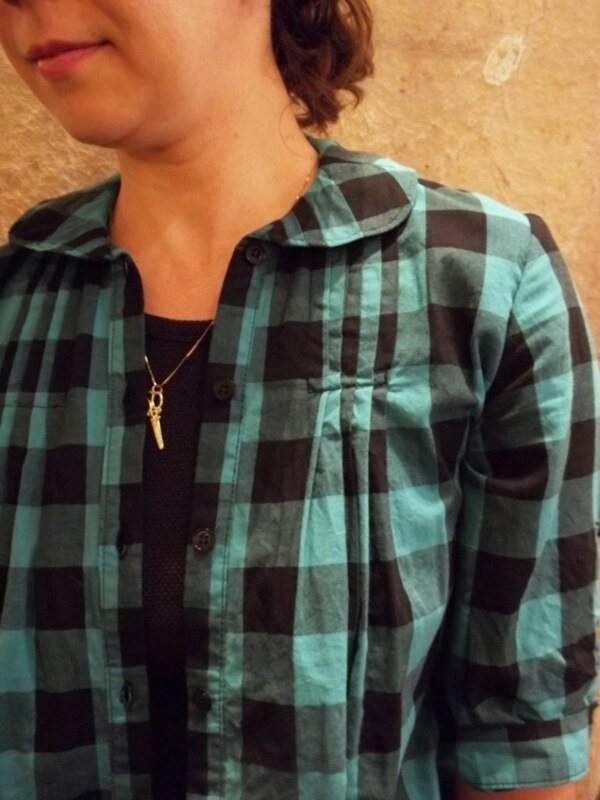 The horizontal pin tucks on the left sleeve lines up exactly with the ones on the left tunic side, creating the illusion of a continuous line when my arm hangs down (which you can see in the picture, if you look closely). A corner turner was a necessary staple to keep the two layers of fabric together to make all these pin tucks at only 1/8 inch big. The tucks are also tapered to end at the neckline as well as on each side of the side seam because these spots were too thick to go through (see small picture). Modern RTW items helped my tunic turn into an outfit. 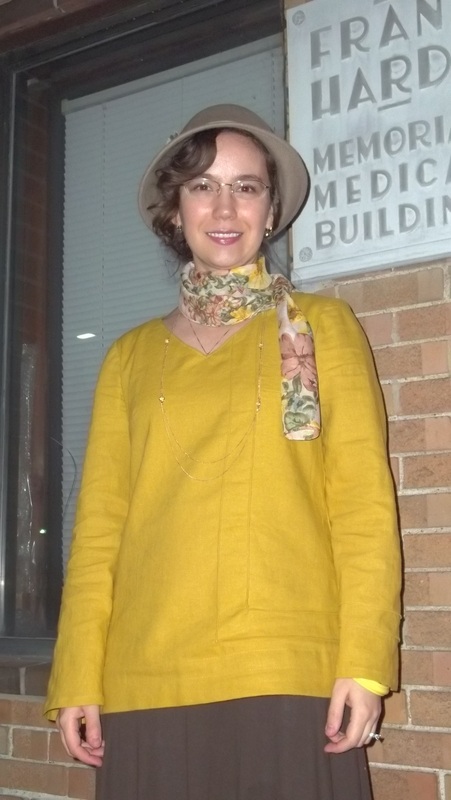 A staple in my closet – an Old Navy brand skirt – became an era appropriate match for my tunic. 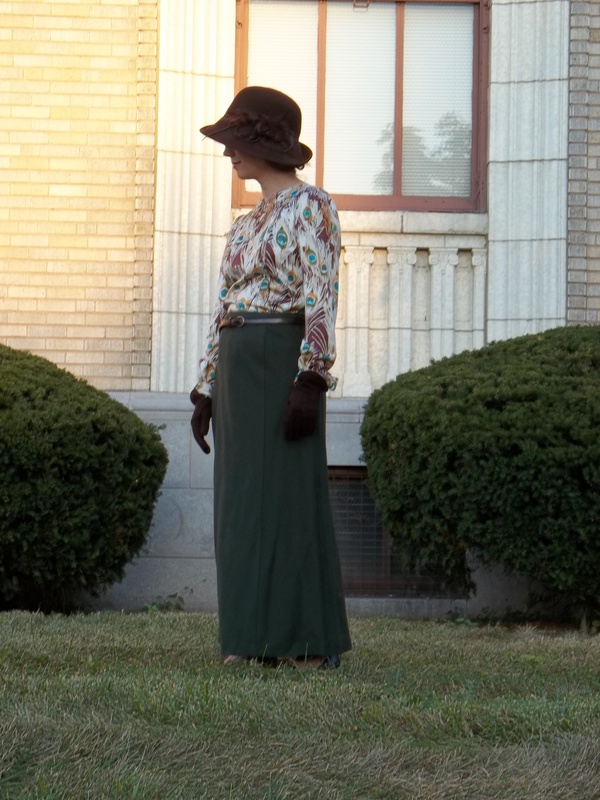 With the skirt’s “high-low” hemline, bias cut, and knit fabric I suppose this outfit I put together would be a late 1920’s style. Check out my shoes! 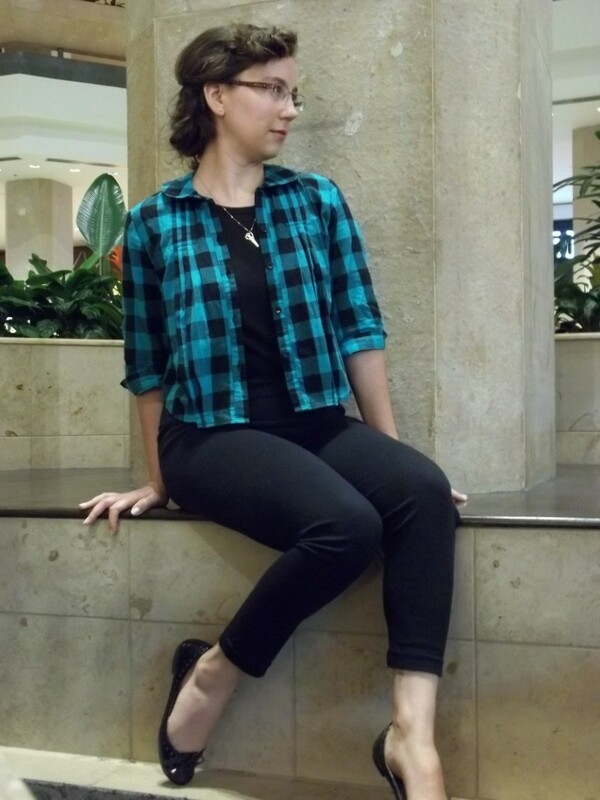 They are “Maxin” by Chelsea Crew, found at ModCloth or DSW, to name a few providers. Bought at a good price, my shoes are so comfy! I think they are THE piece that ties my outfit together with my tunic, both era wise (having the 20’s t-straps) and color wise (very rarely do my shoes exactly match when it comes to such an odd color). 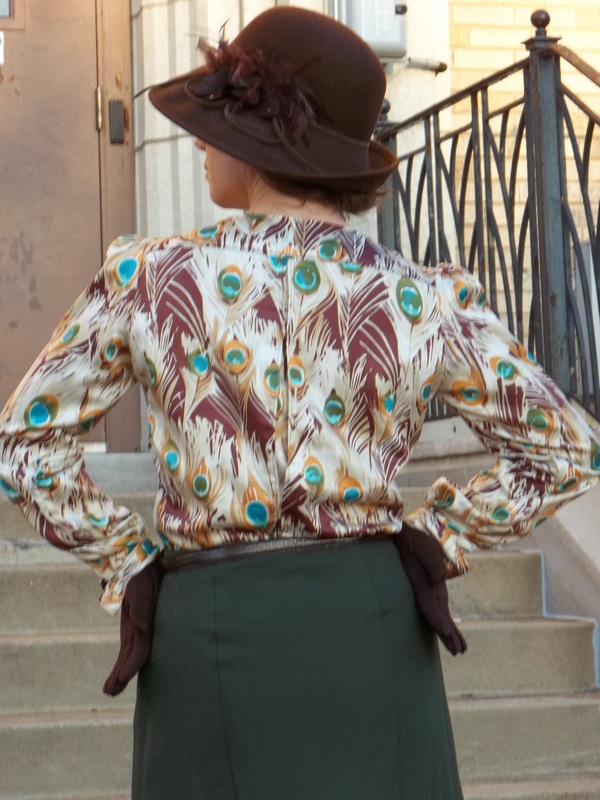 Our photo shoot location was at two 20’s/30’s era buildings a few blocks away from our home. 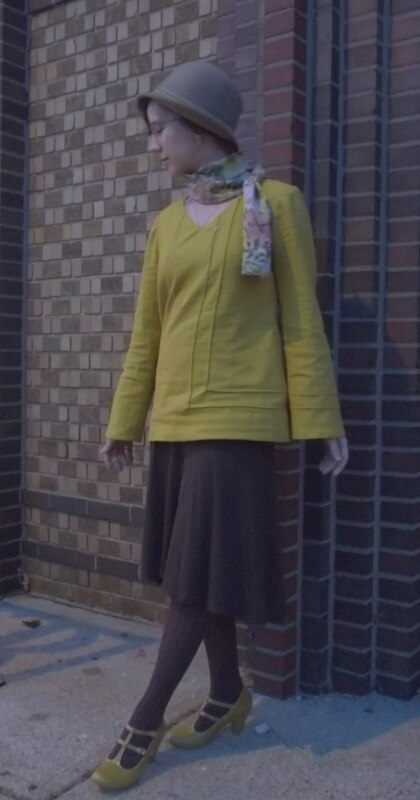 It’s so fun to try to match my outfits I make with era appropriate locations around our town; it gets us out to explore and pay attention to what’s in our own town! Several passerby’s who saw our photo shoot really seemed to enjoy watching our photo shoot and I hope I brought to life a past era for them. I certainly enjoy imagining myself back 80 or 90 years ago, when these buildings were new…I’m hoping I would fit in wearing my handmade tunic. The thought of “would I fit in if I were in year -” is my true historical test for my creations. 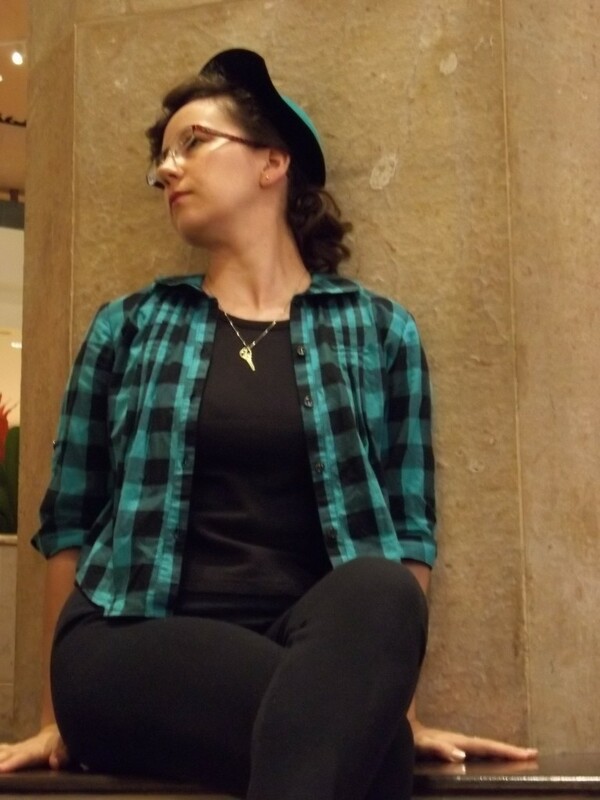 I happily feel that my geometric pin tucked tunic passes this test. The picture above is showcasing a very decorative doorway lintel, dating from the 20’s/30’s. 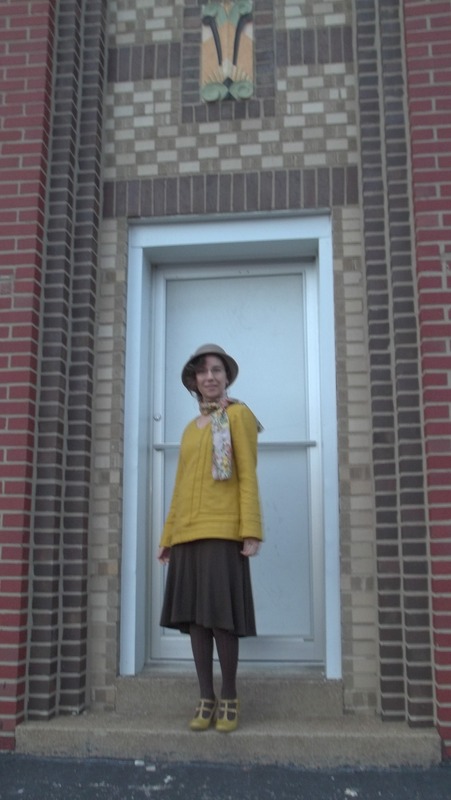 This is the second photo shoot taken under a Deco doorway lintel found in our neighborhood – the first pictures are at my “It’s De-Lovely” blog post. 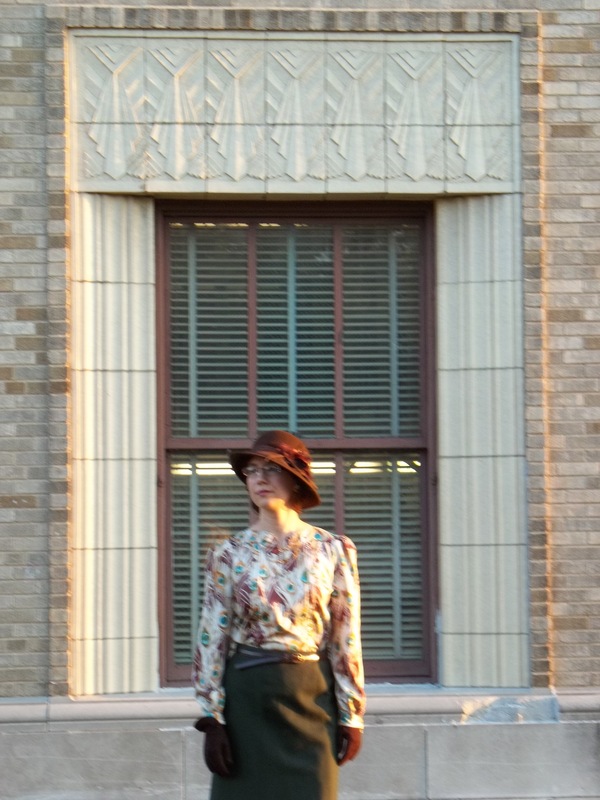 In this second picture, I’m posing in front of a different building, dating to the 20’s, carrying an old original sign, “Frank Hardt Memorial Medical Building”. It is our photo shoot’s second building (and also in our neighborhood), still serving to fulfill medical purposes as a family owned pharmacy which has proudly been around for 80 years. What’s cool is how it’s actually hard to tell the two buildings apart, other than these two last pictures. Both buildings share the same builder, even though they’re a half mile apart! You just can’t get a better example of Art Deco architectural art in the area where we live, than the two buildings which we included in our photos.